Last year, Antonopoulos addressed the Canadian Senate and recently helped make the case for Bitcoin before the Australian Senate. His book, Mastering Bitcoin is considered to be the authoritative resource on Bitcoin and blockchain technology. DEC_TECH will begin at 6:30p.m. with an introduction by host Anthony Di Iorio. Presenters include Amber Scott, chief AML Ninja at Outlier Solutions, on the topic of the current state of digital currency regulation in Canada, and Gerald Cotten, CEO of QuadrigaCX, which recently announced that it is set to become the first publicly traded Bitcoin exchange in the world.In addition to the presentations, DEC_TECH will showcase select Toronto based Bitcoin companies including Coinkite, QuadrigaCX, and Cryptiv.“As Toronto’s fintech community continues to grow, MaRS is excited to connect the startups, entrepreneurs, investors and industry experts who are passionate about decentralized tech, cryptocurrencies and fintech advancement,” said Adam Nanjee, lead, MaRS FinTech. See a full list of participating startups and speakers at the DEC_TECH event page.Space for this free event is limited and guests are asked to register in advance. Doors open at 6:00p.m., with presentations from 6:30p.m. until 8:00p.m. and networking opportunities and refreshments to follow until 8:30p.m.About DEC_TECHFormerly known as the Toronto Bitcoin Meetup, DEC_TECH is organized by Decentral in Toronto in partnership with MaRS Discovery District to provide a hub for people with a passion for decentralized tech, cryptocurrencies and fintech advancement. 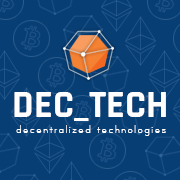 Join the DEC_TECH community here. About MaRS Discovery DistrictMaRS Discovery District (@MaRSDD) in Toronto is one of the world’s largest urban innovation hubs. MaRS cultivates high-impact ventures and equips innovators to drive economic and societal prosperity. MaRS provides expert advice and market research, and makes connections to talent, customers and capital. MaRS startup ventures have created 6,500 jobs and, in the last three years alone, they have raised $1 billion in capital and generated $500 million in revenue. Could Abra be Bitcoin’s “Killer App”?